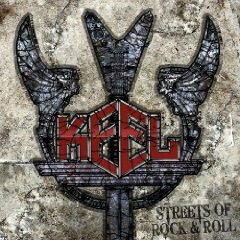 Look who's back after 17 or 18 years, Mr Ron Keel and his band Keel!!! I remember their latest album VI - Back In Action and the notice in the end of nineties that Ron Keel reinvented as a country singer called Ronnie Keel, some appearance during the Kiss acoustic tour pre-reunion where he plays an acoustic solo gig, an acoustic version of the Steeler song Serenade on a Steeler compilation of live / demo tracks, and the 2009 live appearance with Keel at 2009 edition of Rocklahoma, and now this new cd. This is surprise for me, a nice surprise... But now is better to talk about this CD. An important advice for the first hour fan of Keel: forget the sound and the rage of Lay Down The Law and The Right To Rock, this album follow the line of the latest Keel albums. After all these years Ron has still a good vocal range, not like the first albums. But this is a normal thing and can be appreciate on the entire album, that starts - not so good - with the title track. But the quality level grows up from the second track Hit The Ground Running and the following and heaviest album track Come Hell Or High Water!!! God, it's really a pleasure to hear that voice on a heavy song!!! Does Anybody Believe is the ballad, and the other tracks like No More Lonely Nights and The Devil May Care are the classic sound of Keel, a real trademark, a good way to say to the world 'we're back'!!!! In my memory the year 1985 is still alive and the place where I bought this title in vinyl, I was 15 years old kid. Oh my God, how many years gone by and now I write about this... unbelievable!!! I always loved this album, the anthemic title track - a video can be seen on YouTube -, the powerful sound (courtesy of Gene Simmons), the band logo. In 1985 Keel were to me so cool! This album starts with famous title track, is impossibile that anyone of you don't know this song, a real anthem, a title that anyone knows The Right To Rock!!!! This time is not necessary to do a track by track, but I want to remember that some songs are also present on the first Keel record like Lay Down The Law, Speed Demon and the Rolling Stones' cover Let's Spend The Night Together. This remastered version contains 2 bonus tracks, a remix version of Easier Said Than Done and a new version of The Right To Rock. So what are you do again on your PC? Please go and get this CD!!!! This is an order!!! 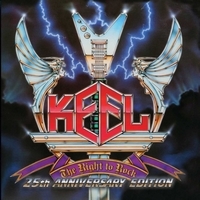 I can't believe it's already 25 years since Keel's album The Right To Rock hit the stores! And finally it's available on CD for the price of a normal CD. After years of legal fights to get back the rights of the recordings they succeeded and so metal fans can finally listen to the remastered version of The Right To Rock! The title track is also the opener and with powerful riffs and Ron Keel's vocals they take you back in time. The album was released in 1985 and got a lot attention, coz it was produced by Kiss mastermind Gene Simmons, but even if these days the songs rock! Okay, younger metal fans probably find the songs backdated and the lyrics kinda cheesy, but in the 80's this was it! Keel and Mötley Crüe were the bands who had a rawer sound, were heavier then many of the hair bands. The Rolling Stones' cover Let's Spend The Night Together was played before other bands hit the stage, Keel kept the typical Stones sound and added a dash Keel. Additionally they remixed the title track and Easier Said Then Done, the new versions show that Keel 2010 can still rock, the songs sound a bit more modern, but they still have this 80's vibe. Cool! Songs like The Right To Rock, Easier Said Then Done, Electric Love and Speed Demon every metal fan should know, even if one is into more extreme stuff, you should know the classics! And this is one of them!